Determined to approach my fear of cornstarch as a thickener I decided to make this big weekend of pies all about cornstarch. That meant at least one cream pie. 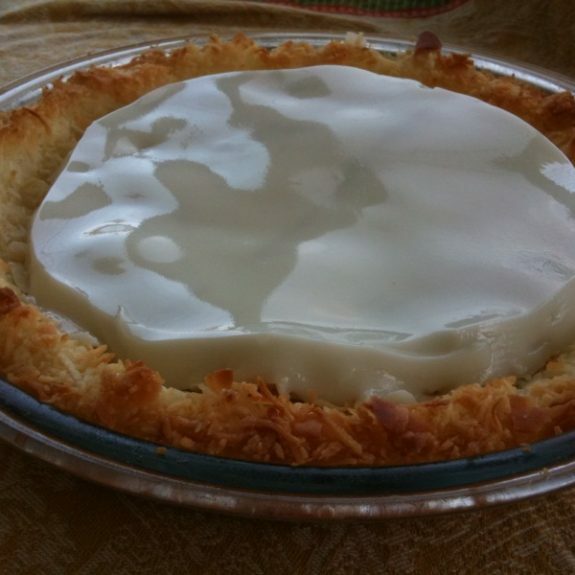 Inspired by the Duo Dishes Pineapple Haupia Pie (Pie-a-Day #9) I decided to do a layered Haupia – Banana – Cream Pie. Since the cream pie has many avid followers like KCRW’s own Bob Carlson, I knew I would have a critical mouth eating the pie. I decided to use a packaged Haupia Pudding Mix, I know, don’t yell. One reason is that I understood everything on the package and figured that it would give me a good idea of the ideal consistency. Of course when I saw that the packaged mix required only the addition of water I had to start futzing with it. I (rightly, as it turned out) figured that the pudding would be extremely firm made according to package directions. The box directions called for 2 cups of water and I added ¾ cup additional water and ¾ cup coconut milk. I poured the completed pudding mixture into a cake pan roughly the same diameter as the pie pan I planned to use. I put the pudding in the refrigerator and let it set up as I prepared the crust and the Banana Cream Custard. 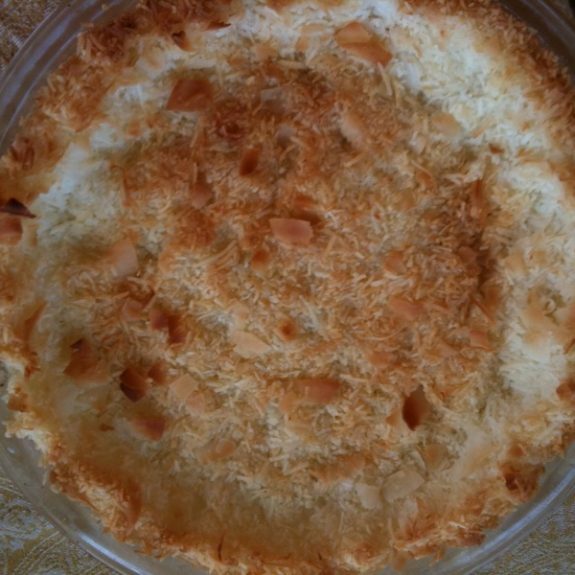 I decided to reinforce the coconut nature of the pie by making a pure coconut crust. Knead the butter into the coconut until it is thoroughly and evenly mixed through. Pat the mixture into the pie pan (I used a 9” pyrex), creating a nice even edge. Put “crust” in a preheated 375° oven and bake until spotted golden brown throughout. Remove from oven and let cool completely. I think I’ve finally found the pie custard recipe that suits my taste. Thick enough to cut nicely when well-chilled yet not pasty. I don’t add vanilla to the custard because I prefer the flavor of the other ingredients to not be overwhelmed by the vanilla aroma. Add it if you wish. Whisk the egg yolks, sugar, cornstarch, salt together with ¼ of the half and half. Scrape mixture into a heavy saucepan. Whisk in the remaining half and half. Over medium-high heat used a wooden slanted spatula to constantly stir the mixture. Using this particular implement will prevent scorching and sticking of the mixture to the bottom of the pan. It will take about 8 to 10 minutes for the mixture to start to thicken. Once this happens turn the heat down low and continue cooking and stirring until it is very thick, an additional 3 to 4 minutes. If you want to add vanilla do so know when your custard is off the heat. Scrape the mixture into a small bowl and cover with plastic wrap so that it touches the custard to prevent a skin from forming. Put in refrigerator to chill. Peel the banana and cut it into quarters vertically then cut across into ½ inch pieces. Place pieces into small bowl. Sprinkle a tablespon of brown sugar and 2 tablespoons of rum over the bananas and stir to mix. When custard mixture is cold drain the bananas of excess liquid and fold them into the custard. Set banana custard aside. Take the cold and set Haupia pudding and turn it out onto a flat plate. Cut it down into a circle that will fit inside the coconut crust. Remove the excess pudding and put it in a small bowl to eat by itself later. Turn the circle of pudding out into the Coconut Crust. Spoon the Banana Cream Custard onto the Haupia Pudding and spread it into Coconut Crust. Place the nearly finished pie back into the refrigerator while you make the whipped cream. I use powdered sugar instead of granulated to help stabilize the cream. Beat the cream and powdered sugar together until stiff. Decorate pie with whipped cream by either piping it on in rosettes or slathering and swirling the cream. Keep cold until serving.